Best Upholstery Cleaner in Boulder, CO 80301, How to Clean Gum Off of Your Upholstered Furniture. From Stain-Removal-101.com. For more articles like this, click on Cleancare Articles. Step 1: Scrape off the excess gum with a dull knife. 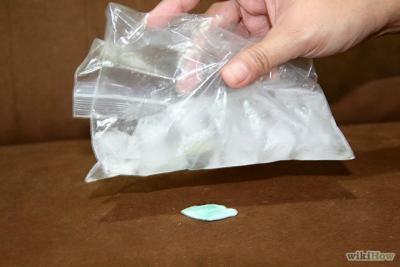 Hint: If the gum is still soft, and has not yet hardened, you can make it brittle, and thus easier to remove, by putting some ice into a plastic bag and placing this on the gum. Be careful, however, that you don't use a thin plastic bag or platic wrap to cover the ice or the plastic will stick to the gum and cause a bigger problem. A freezer safe baggy should be thick enough not to stick to the gum. If you don't have such a thick plastic bag you can just apply the ice directly to the gum. Just be careful to not let the ice drip onto the upholstery and gum. Step 2: For the gum stain still remaining after you have scraped off as much of the chewing gum as you can take a clean white cloth and sponge the stain with a dry cleaning solvent, or with a chewing gum remover safe for upholstery. Hint: First, be sure to test this solvent or remover on an inconspicuous area of the upholstery to make sure it is safe, and does not harm or discolor your upholstery. Step 3: Next, blot at the stain until the solvent is absorbed. Step 4: Repeat steps 2-3 until the stains are removed from the upholstery. If this does not completely remove the stain continue on to the next step. Step 5: Mix a solution of two cups warm water, one tablespoon dishwashing liquid, and one tablespoon of white vinegar. Step 6: Using this solution, sponge the stain from the gum with a clean white cloth. Step 7: Next, blot at the stain until the liquid is absorbed. Step 8: Repeat steps 6-7 until the gum stain is removed from the upholstery. Step 9: Now that the stain is removed you should get plain cold water and a new white cloth and sponge the area to remove the cleaning solution, and then blot dry. Hint: Be sure to get the upholstery only as wet as necessary for chewing gum stain removal. For other spots or stains on your upholstery that you just can't get out yourself, call Cleancare Upholstery Cleaning at 303-530-0646. Second Upholstery Piece Half Price!